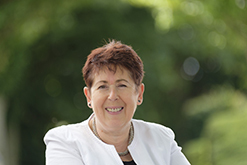 Polly Purvis, the CEO of digital technology industry body ScotlandIS, has announced that she will retire later this year. Karen Meechan has been promoted to to the role of Chief Operating Officer. “Earlier in the year I shared our plans for 2019 as we move to being a combined cluster management organisation and membership body, with a strong focus on cyber and data,” said Purvis. “There is another element to our evolution; this is the year I plan to retire. “We have a fabulous membership full of interesting, innovative and growing technology businesses who build and deliver high quality goods and services. “We also have a great team at ScotlandIS, dedicated and knowledgeable. “So I think now is a great time to hand on to someone who can bring fresh passion to the organisation with the belief that technology can be a real force for good, who can help develop the potential of the digital technologies industry as a major force in the new economy and lead the team during the next phase of development. “Collectively the board and the management team have real ambition to build ScotlandIS and I believe we’re very well placed for the new phase of growth. “I will remain in post until a new CEO has been appointed to ensure a smooth and orderly transition. Purvis added: “Karen and I have worked together for over ten years and she knows our members and the business inside out.